On my way to my dentist in the 1960s and 1970s, I walked past the big six-floor red-brick building at 320 West 12th Street that housed the Village Nursing Home, and on sunny days I usually saw some of the residents sitting in wheelchairs out on the sidewalk in front, getting a bit of fresh air (if “fresh” is appropriate for New York City air). When my dentist, whose office was just across West 12th, told me of making visits there to tend the residents, I asked him how it was. He gave a mixed review, saying that some of the staff were truly committed, while for others it was just a job, which is probably the case with most nursing homes. At least, no horror stories emerged from there, so far as I recall. The Nursing Home building today. Two of its residents were legendary in the Village. Marion Tanner, a graduate of Smith College and onetime actress often described as the inspiration for Auntie Mame, was made famous when her nephew, under the pen name Patrick Dennis, allegedly wrote about her in a best-selling 1955 novel that became a Broadway play starring Rosalind Russell (I saw it in 1957, loved it), then a movie that became a Broadway musical that in turn became a movie. Ms. Tanner at first embraced the notion that she was the model for the eccentric, fun-loving Mame and coasted on it for quite a while, then distanced herself, insisting that she was a nicer person than Mame. But as late as 1977 she was photographed in the nursing home, white-haired and smiling benignly, under a photo of Rosalind Russell in the film. Whether or not she was the model for Mame – accounts differ -- she was certainly a colorful Village eccentric, opening her home at 72 Bank Street to struggling artists, writers, freethinkers, and radicals (“Bohemian types,” she called them), whom she encouraged in their careers. But in time she loosened her standards and also let in derelict drunks, ex-inmates, addicts, and shopping-bag ladies. The house finally became a shambles, strewn with garbage and reeking of urine. There was no lock on the front door, so while she would be off in a corner doing yoga and meditating, all kinds of people would be in and out of the house getting a free meal in the kitchen; the silverware soon disappeared. Her nephew shared the dismay and disgust of the neighbors, and discontinued the monthly stipends he had been sending her. She herself by now was sleeping on the top floor in a black sleeping bag full of roaches. Playing Lady Bountiful to these nonpaying guests took its toll financially as well. In 1964, unable to keep up the mortgage payments, Ms. Tanner lost the house and, along with all the residents, was evicted. By now, dowdy and straggly-haired, she herself looked more like a bag lady than Rosalind Russell’s elegant Mame, and she was on crutches as well, having broken her leg. But on the day of the eviction she made sure the press was on hand, for she relished publicity. The new owners hired a crew of four men to work twelve-hour days for a week cleaning and fumigating the house, and when they moved in, there was a crunch of dead roaches under their feet. Following the eviction Ms. Tanner moved into Bierer House, a halfway house for the emotionally troubled in Chelsea, where she was supposed to look after things while the owner was away during the day at work. She stayed there for thirteen years and seems to have made a hit with the tenants. In 1977, suffering from increased physical deterioration and senility, she found refuge in the nursing home, where her regal manner soon made her one of the stars; among her many visitors was none other than First Lady Rosalynn Carter, on an official visit. But when, against Ms. Tanner’s fanatical will, the home’s assistant administrator had to wheel her out of her room so workman could proceed with much-needed renovations, she spat in the woman’s face. In 1985, two months after a severe stroke, she died in the home at age 94. When I checked out her Bank Street address recently, I was surprised to find it was only a five-minute walk from my building on West 11th and Bleecker. It’s a plain three-story red-brick building, and no plaque identifies it as the onetime residence of the alleged prototype of Auntie Mame. Maybe, even after all this time, the neighborhood would just as soon forget about the antics of Ms. Tanner and her waifs and strays. The other legendary resident of the Village Nursing Home was Genevieve Camlian, who in 1977 attributed her living to the age of 93 to her daily ration of Guinness Stout, the famous Irish dark beer that is marketed worldwide. In earlier days she had run about doing fortune telling based on the I Ching, the ancient Chinese divination manual; one young man who encountered her called her an “Irish witch.” Despite failing eyesight, after lunch at the nursing home she would trek down West 12th Street to the No Name Bar for her Guinness, which she, a native of Belfast, described as a “nutritional Irish drink.” The bar’s owner, who let her run up a tab, had been captivated by the way she read poetry – she especially loved Yeats -- with her Irish lilt, and some twelve years earlier had arranged for her to enter the nursing home. Little is known of her life before that. Long before I heard of Marion Tanner’s residing there, I had heard of Ms. Camlian’s residence at the home and her daily imbibing of Guinness. In researching this post I wondered if the two had ever become acquainted, and imagined that a convergence of all that free-living eccentricity would have been dynamic, even explosive. Then I learned that they had indeed known each other before, shared an interest in the occult, and “palled around” together, but by the time they were in the nursing home they detested each other and were no longer speaking; two prima donnas in one nursing home was probably one too many. But the media loved them, and they were often mentioned in articles and TV news spots about the nursing home’s lack of funds and imminent demise; as a result, contributions poured in and helped save the home. New to the Village in the 1960s, I assumed that the nursing home had always been there, and that it always would be, which shows my ignorance and naiveté. Like all old New York buildings, it had a long history, and that history was – and is -- still unfolding. 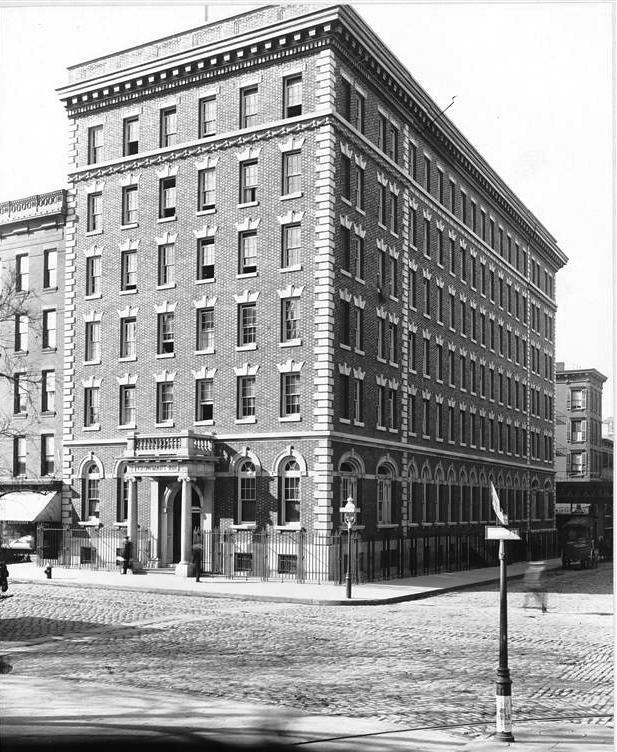 The building that later housed the Village Nursing Home was built in 1906 by the wealthy New York City merchant William Martin as a residence for the young unmarried women who in those days worked in shops and department stores or in apparel and millinery factories, earning barely enough to buy food, much less pay rent. Named the Trowmart Inn, the building on the outside was the same one I see today, a six-story red-brick building with granite facing and terra-cotta trim. It could accommodate 400 women, each of its 10-by-12-foot rooms having a bed, a dressing table, a washstand, a table, and a couple of chairs: hardly luxury housing, but for working girls of the time, modest but comfortable accommodations. 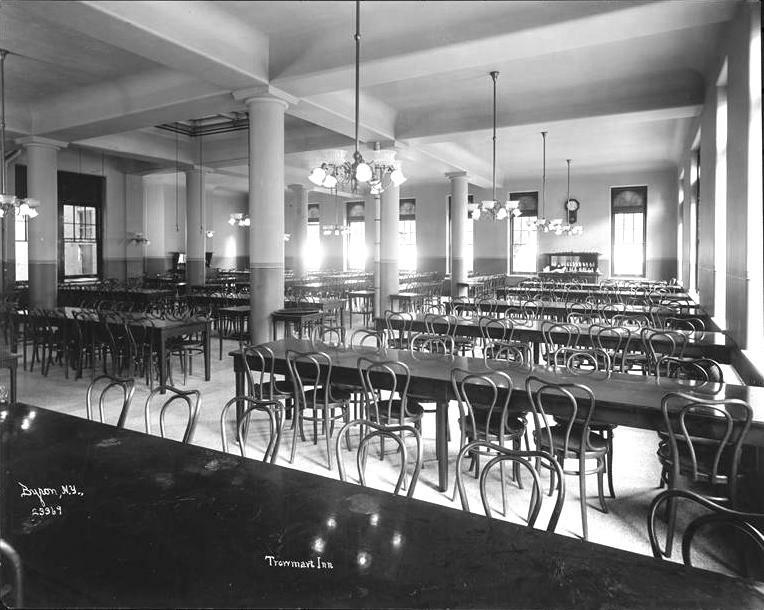 The building also had a spacious dining room, bathrooms, laundry facilities, a library, a full-time nurse, and six ground-floor parlors where the residents could entertain gentlemen callers, since Mr. Martin thought that the best solution for the working girl was a respectable marriage. Rent was $3 a week for a shared room, and $4 for a single, and included breakfast and supper. Staying out late was discouraged; the elevators stopped running at 11 p.m. And under no circumstances were gentlemen to be entertained above the ground floor. To be eligible, a woman had to earn less than $12 a week and be under age 35. Within a year the hotel was full. Life at the Trowmart Inn was hardly dull. Dances were held in the main parlor three times a week, and silk hats and frock coats abounded, indicating that the gentlemen callers were of a certain status; to find favor with the girls, a gentleman needed to don his cleanest shirt and highest collar and, for a final touch, an artificial gardenia pinned to his buttonhole. Many a ragtime romp ensued, and Mr. Martin’s goal was no doubt attained when, discreetly in the ground-floor reception rooms, marriage proposals were forthcoming. 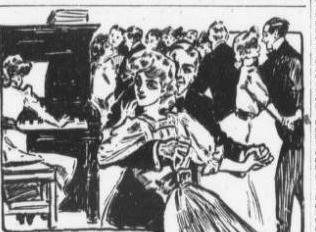 A dance at the Trowmart, 1908. 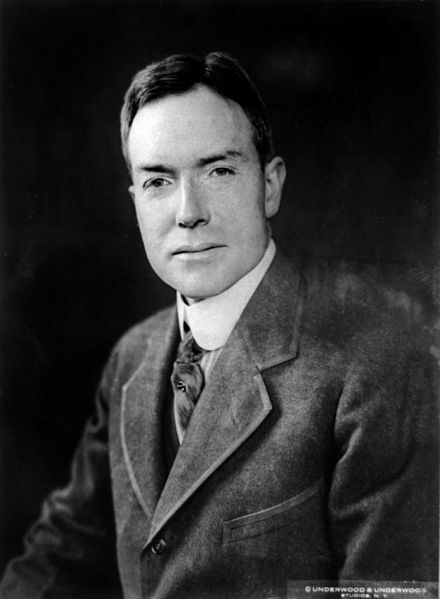 John D. Jr., in 1920. As the years passed, times changed again; the need for women-only hotels declined, and the purpose of the Laura Spelman Hall became obsolete. In 1958 the building became the Village Nursing Home, the only such home in the Village, with a private, for-profit operator. But financial woes beset it from the outset, and it had trouble meeting government standards. (Wikipedia states that in the early 1970s the owner absconded with the home’s funds, but I’ve found no confirmation of this.) Threatened with closing in 1977, it was saved by a community effort that got help even from First Lady Roslyn Carter. “Save our nursing home” was the cry, inspiring neighbors to hold cookie sales and restaurants to donate $275,000 to buy the building, and a coalition of church groups and social agencies to form a nonprofit organization, Village Care of New York, to run it. Village Care grew impressively with time, but in 2004 it announced that it would close the facility and open a network of community residential health-care sites called SeniorLife Choices. The building had become cramped and outdated, with water damage and cracked walls; in keeping with the latest trends in health care, the new facilities would have more of a family feeling and less of an institutional one. Clearly, this was a concerted effort to change the public image of nursing homes, which were often viewed with suspicion and contempt. In 2007 the building was sold for $33 million to FLAnk, a condominium developer, which waited several years until Village Care, facing construction delays at its new Houston Street facility, could leave, then gutted the building and created ten spacious units, including two duplex penthouses. Thanks to the delay, the timing was right, for the luxury housing market, crippled by the Great Recession of 2007-2009, was now reviving with a roar. Brought to market in June 2013, the units – “townhouses in the sky,” as the developer described them -- were soon sold for prices ranging from $8.75 million to $31 million, prices that, for the West Village, were without precedent. Now christened the Abingdon, the building offers a 24-hour doorman, a gym, a sauna, and private basement storage rooms for each unit, not to mention fine views of Abingdon Square Park across the street and, for the penthouses, the Hudson River. And Village Care? 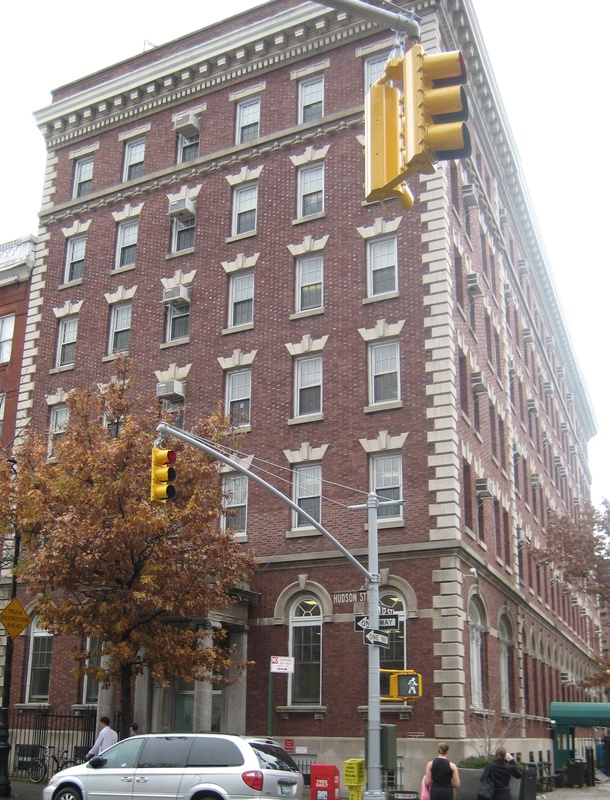 In 2010 the Village Care Rehabilitation and Nursing Center, to use its full name, opened its new facility at 214 West Houston Street, between Sixth Avenue and Varick, where it serves not as an end-point facility, but rather as a place where patients get rehabilitation and recovery care that prepares them to return home. The 6-story, 105-bed facility is the first newly built skilled nursing facility for seniors in Manhattan in more than half a century. On each floor there is a “commons” area where patients can socialize with other patients, dine, relax, and visit with friends and family. A healing bamboo garden, offering a place for quiet social interaction and contemplation, reflects Village Care’s determination to offer “with it” twenty-first-century healing, as opposed to the traditional institutional atmosphere that characterized the old Village Nursing Home. And Village Care has other facilities as well, treating a total of 14,384 patients in 2014. So ends, for now, the saga of the Village Nursing Home, aka the Trowmart Inn, Laura Spelman Hall, and now the Abingdon. 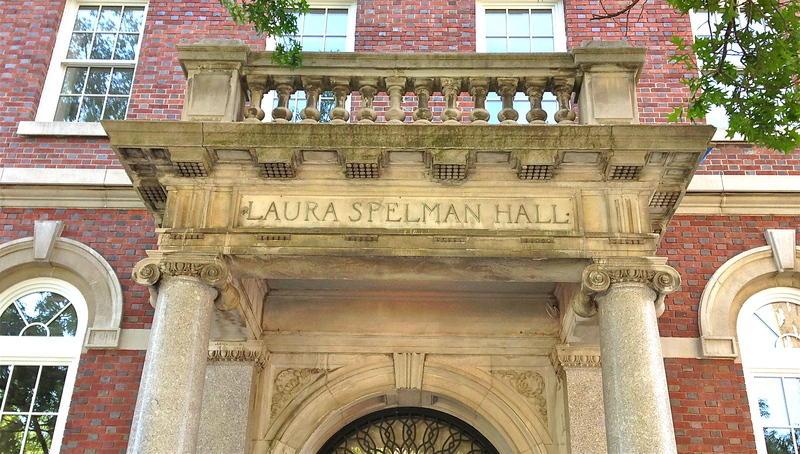 When the scaffolding was removed in 2013, the old 607 Hudson Street entrance was revealed, its rounded arch flanked by columns and, carved in stone above, the words LAURA SPELMAN HALL. I see it every day when I pass what was once a reasonably priced residence for young working girls and is now a luxury condo. For the new residents of the Abingdon who don’t enjoy a view of the Hudson River and sunsets over New Jersey, there is a view just across Hudson Street of Abingdon Square Park. 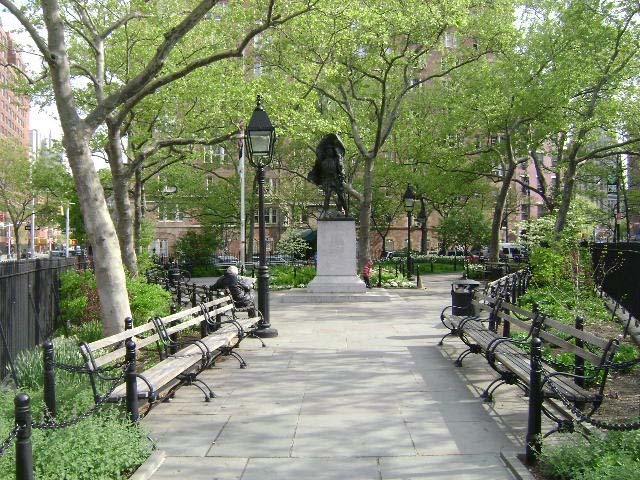 A small triangular park bounded by West 12th Street, Eighth Avenue, and Hudson Street, it has its history, too. Originally it was part of a 300-acre estate bought by Sir Peter Warren, a British naval officer, in 1744. When his daughter Charlotte married the 4th Earl of Abingdon in 1766, she received land in the area as part of her dowry, and the site became known as Abingdon Square. After independence, in 1794 the City Council voted to replace all British place names, but the name of the square was spared, since the Earl and his wife had sympathized with the rebellious Americans, and he had argued in Parliament against British policy in the thirteen colonies. In 1831 the Common Council decided to make a public park of the site and subsequently bought the land and enclosed it with a cast-iron fence that still stands today. Then in 1886 the renowned architect Calvert Vaux was hired to create a new design for the park, which became a center of community life and the site of well-attended public concerts. But in 1931, years before the creation of the Greenwich Village Historic District, a row of charming old red-brick homes on the north side of West 12th Street was demolished to make way for the massive 16-story brick apartment building at 299 West 12th Street that towers oppressively over the park today, its awninged entrance presided over by a uniformed doorman. But all was not lost, for in 2003-2004 the park was renovated so as to restore its nineteenth-century atmosphere, with 1850s-style benches, bluestone walkways, and three cast-iron light poles replicating the gas streetlamps of another day. Founded in 2000, the Abingdon Square Conservancy, a nonprofit community organization, now works in cooperation with the city to maintain the park, and I can attest that it does so magnificently, with frequent plantings of fresh flowers in season. And, just outside the fence, on Saturday mornings throughout the year a greenmarket appears that I visit regularly to get bread and, in season, cherries and blueberries and apples from the farmers. Presiding over the Park is the Abingdon Square Doughboy, a statue by Philip Martiny honoring the dead of World War I, whose dedication in 1921 was attended by 20,000 people. Today, alas, its worn inscription is almost unreadable, and the statue itself is barely noticed by passing strollers, cell-phone addicts, and dog walkers. So if the residents of 299 West 12th Street and the outrageously wealthy new occupants of the Abingdon enjoy fine views of the park from their lofty domiciles, so do I when I stroll through there almost daily, and I don’t pay an exorbitant rent for the privilege. Coming soon: Patent Medicines: Cocaine Toothache Drops (meant specifically for children), Hostetter's Bitters (why did it make you feel so good? ), Dr. Williams' Pink Pills for Pale People, and oh yes, Coca-Cola and 7 Up.